"Bullseye! by Dave Halls really does hit its mark. 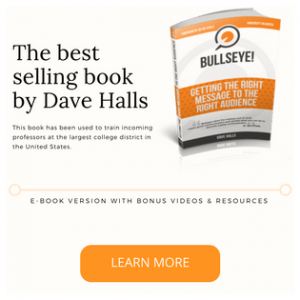 If you’re looking to learn the skills required to really connect with your audience, then “Bullseye!” is required reading. From the framework, to the medium and language, Dave covers every aspect with great detail, and in an easy to understand fashion!" "What a splendid book! A brilliant five step process to build an effective message for any type of communication medium. It teaches anyone how to develop the right message for the right audience. Every person should own a copy of “Bullseye!” – it is a great resource that is packed with actionable strategies to fast impact your life, work and dreams"
"This outstanding book on communication has been best seller on Kindle and is currently being used the largest college district in the U.S. and was part of a study where professors preferred Bullseye over textbook instructions....Dave Halls’ university validated "Bullseye!" offers you the scientific steps to becoming a great communicator regardless of the communication medium. You'll learn within the pages of Bullseye! the secrets of good communication and the five steps to crafting a clear message that meets your purpose and resonates with your audience." "I recently attended a workshop on Writing Skills presented by Dave Halls. ... This training provided me valuable insights into the art of writing and got some tangible learnings from his workshop. I also plan to read his book Bullseye to enhance my learnings from the training. 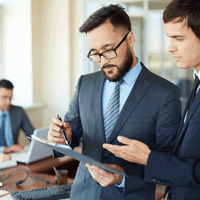 I recommend his training to anyone seeking to be effective in written communication." University validated. 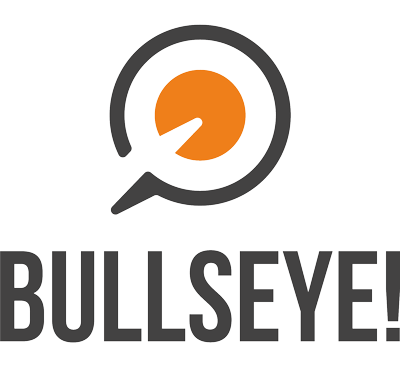 The Bullseye method has been shown in studies to improve communication success and improve productivity. You can use it to create marketing, operational and leadership comms regardless of media. And that’s just some of the research. You’ll also find studies that show how good communication improves your social and personal life. …but then you probably don’t need science to prove that! 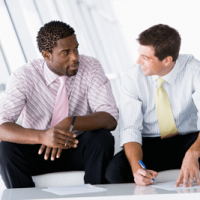 Being a great communicator helps you grow your business or career. You can use it to attract customers and clients through marketing and persuasive communications. 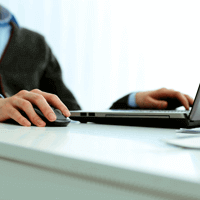 You can use it to maintain or improve the efficiencies of your organisation. And you can use to lead your team or workforce. But then, you can’t blame them for this. Whilst experts and researchers have been clear on what you need to do when it comes communication success, there’s a BIG silence when it comes showing you HOW! For example, how often have you got advice on how to improve your copy as “make it more persuasive”… but without being shown how to be persuasive? Or advice for how to connect with your reader better by using a style that is “more conversational”… but without being shown how… Or to make the message clearer by using a story but without being being told how to tell a story in a way that captivates people. You might think you’re being shown the all important how but in fact just being told what you need to do. Anyone can tell you what to do – but not anybody can tell you how. So the average person in business does the best they can and hopes for the best. They create marketing or operational messages or piece of comms that sort of looks good. Yet they remain frustrated because they know they could have written that document better, made their sales page more persuasive, received better responses from their emails, celebrated more buy-ins after their investor pitch, presented with more clarity and less waffle… but they just didn’t know how. Meanwhile, today’s business environment continues to expect us to be better communicators than ever before. So it’s no wonder that people give up or settle for mediocrity. Besides the bad experiences, the demands are overwhelming! 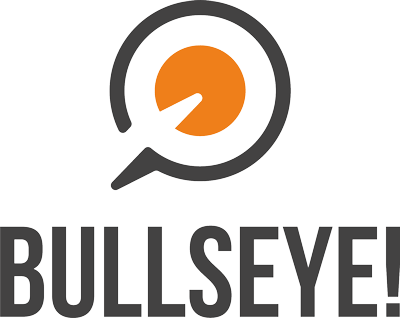 The Bullseye method is an innovative approach that helps you create your marketing, operational or leadership comms successfully. It offers the steps to create a message with laser-like focus on your objective. Then optimise that message for the best media that is going to speak directly to your target audience. As you start using this method as a tool to get business results from your messaging and comms, you’ll find yourself becoming a great communicator in all that you do. The method focuses on the HOW of communication, but also gets you thinking in a way that grows you from within. So you become more natural at getting your message across on paper, online, in meetings and townhalls or on video. You’ll understand what makes great communication and be able to use this to grow your business or career. Even more… it is proven to work. The Bullseye method has been tested and proven to improve communication success and increase productivity. The method was first introduced in Dave Halls’ best selling book Bullseye! – Getting the RIGHT Message to the RIGHT Audience. In the foreword, Dr Joe Vitale wrote “Bullseye! takes the mystery out of what makes good communication and shows you the steps to becoming a great communicator”. The book has been used as a communication text book for incoming professors at the largest college district in the United States. It was also voted the best book on communication because it was practical and helpful to real life. Not just a bunch of intellectual theory, but real, practical “how to” information. The Bullseye method is now university validated. 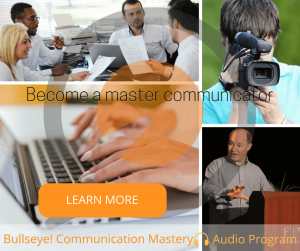 The Bullseye method offers you a step-by-step path to becoming a great communicator. It works for your marketing, operational and leadership comms. It is ideal for entrepreneurs, leaders and business professionals who are genuinely interested in growing their business or career success. These are what you’ll develop and use as part of the Bullseye method. The communicator’s mindset helps you become a great communicator providing you have the right understanding and method. This mindset helps you see the world in the way successful communicators do. It will help you improve each time you have to create a piece of marketing or operational comms or inspire a team. A practical understanding of how great communication works is important because it gives you the universal principles that apply to any interaction. It allows you evaluate and learn from other cases of communication so you can grow in your craft. Finally, a proven method that will consistently help you get the RIGHT audience is critical to becoming a great communicator. It will save you time, create consistency and build success. Each time you use this approach will be an opportunity to learn more and become better. 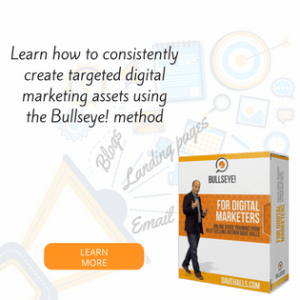 The Bullseye method shows you how to craft a purpose-driven message for your business and deliver it successfully to your target audience. You can use it to create marketing assets like landing pages, blogs, emails and webinars. You can use it to create operational communication pieces from memos, emails, and announcements through to documents like user guides, business cases and proposals. You can also use it to engage your team or workforce and build your leadership authority through messages in person, on video or in print.